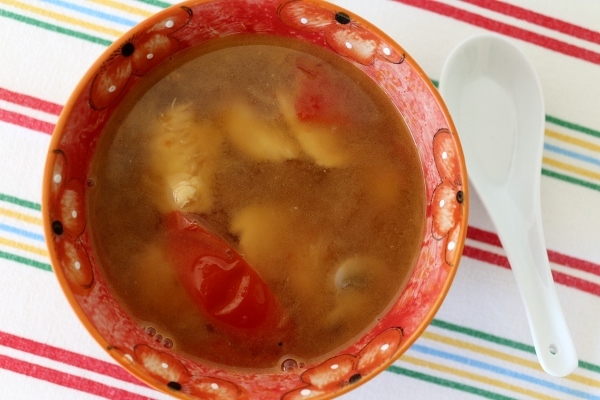 My sister recently got some teeny tiny Thai bird's eye chiles from one of our local farms, and it inspired me to make Tom Yum Gai, or Thai Hot and Sour Chicken Soup. Normally, Thai bird's eye chiles I've seen and used have been much larger than the ones from the farm, so you can easily use a single chile for this recipe, but since these were small I just carefully seeded and chopped them all. Acquiring some of the ingredients for this soup may prove to be challenging. I actually ordered fresh kaffir lime leaves and dried galangal slices on Amazon. The remaining kaffir lime leaves are now hanging out in my freezer for the next time I make this soup. 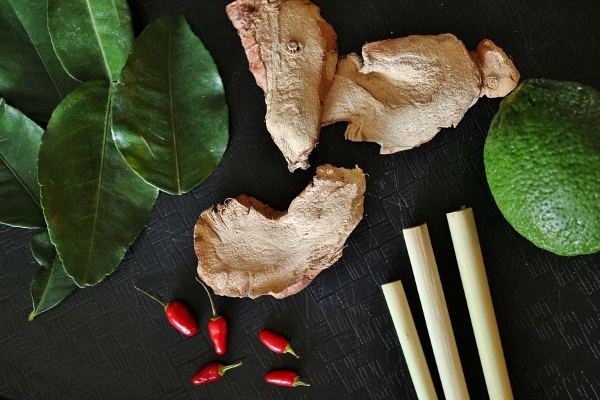 The dried galangal is inferior to fresh, but still works pretty well. 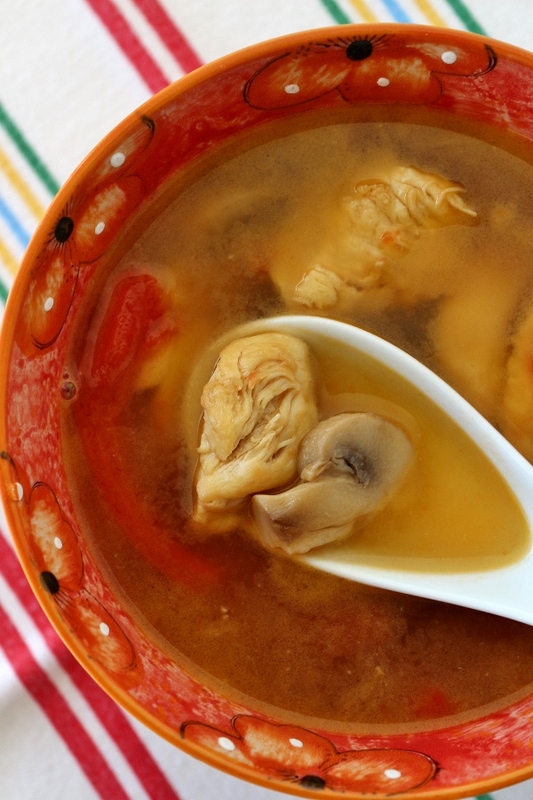 Just make sure you allow some time to soak them in water before starting your soup. I didn't have any cilantro or else I definitely would have added it to my soup before serving. 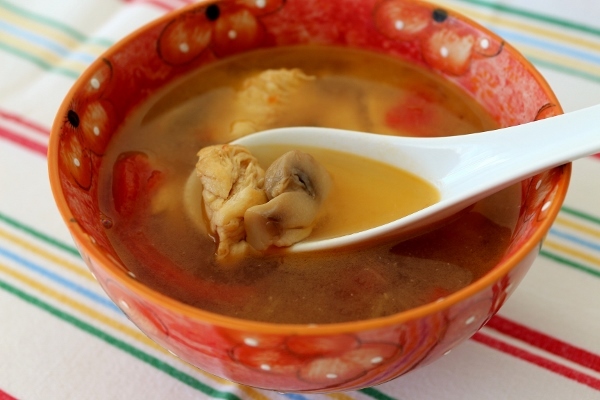 It adds great color and authentic flavor to this already exotic and delicious soup. Although a few of the ingredients may seem intimidating to find, at least in my case I know the lime leaves and galangal will keep for a while in my freezer and pantry respectively, so this soup will be even easier to prepare in the future when a craving hits. In a medium pot or Dutch oven, heat half the oil over medium-high heat. Add the chicken, stirring occasionally until the chicken is just cooked through. Remove from the heat, remove chicken from the pot, and wipe out the interior of the pot with a paper towel. Return the pot to medium heat and add the remaining oil. Add the onion and saute for a few minutes until starting to soften. Add the chicken broth, mushrooms, kaffir lime leaves, galangal, lemongrass, chile, fish sauce, Nam Prik Pao, and sugar. Cover, bring to a boil, then reduce the heat and simmer for about 10 to 15 minutes. Add the cooked chicken, and tomatoes and cook another 1 to 2 minutes until the tomatoes are cooked but not falling apart. Remove from the heat and stir in the lime juice and cilantro leaves, if desired. Adjust seasoning as needed with salt. Serve immediately, discarding the lime leaves, galangal and lemongrass pieces either directly from the soup pot or from each bowl as you eat.